My boys were so bored this morning and had a hard time settling on something to occupy themselves. I had an idea or two but let the boys try and find their own activities first. Ian finally decided to head outside and play in the sand while Alec and Evan chose to pull out some board games. I guess they are getting bored with our games though, because they made up their own rules. There was some argument about how to play the game and when I tried to interject and remind them how the game was played I was informed that they were making up their own "house rules" for the game. I'm all for them using their creativity and making up new rules but I reminded them that all house rules need to be agreed upon by all players before they start playing the game. Alec and Evan played Topple and Nine Men's Morris for a bit and got along pretty well. Once Evan quit, Alec convinced Ian, who had come inside to have breakfast, to play a round of Nine Men's Morris. Alec has just rediscovered this game and LOVES it. He has played at least a few times a day for the past week. Evan and Alec invited a few friends from their old preschool class to come play today as a last hurrah before school started (for their friends). They couldn't wait for the boys to show up and were anxiously awaiting their arrival outside. 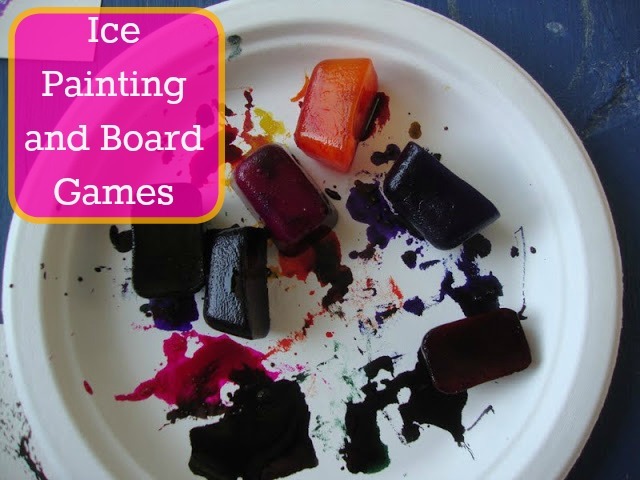 I remembered that I had put some paint and some liquid watercolors into the freezer in some ice cube trays back at the beginning of July for some fun ice cube painting. I asked the boys if anyone would like to try it out today and all three unanimously shouted that they wanted to try it out. I brought the frozen watercolors and watercolor paper outside and they had a blast mixing colors, watching the ice cubes melt. While I will never claim that their artwork came out looking like a masterpiece it was a fun science/ art activity that was really engaging for them. They thought it was pretty funny that their fingers were colored for a while too. I loved the deep intensity of colors they were able to get using the liquid watercolors. Evan asked if we could try it with a paintbrush next time and see what happens. Of course I agreed. I love when they are anxious to try something new. I think they learn so much when they experiment and think of ways to extend an activity. After our company left, the two younger boys decided to head inside and play while Ian stayed in the water until dinnertime. I came inside to fix some sandwiches for a nice, light dinner and found Alec and Evan playing even more games! They had pulled out Trouble and the Disney Scene It! game. We have a Star Wars themed Trouble game and they were using the pawns from the game as actual characters shuttling them all around the house and acting out different scenarios with them. They told me they had played a real game of Trouble too but soon found it more fun to just play with the pieces. As long as they weren't loosing any of the pieces, I didn't mind. The boys sat down to eat dinner, and since it was just the boys eating tonight I allowed them to pick a show or two to watch as long as they could all agree. They ended up watching Cyber Chase and a new Wild Kratts episode about Gila Monsters. I think both of these shows are so educational that I even allow them to watch them as part of "school" so when they pick these types of shows "just because" it makes me so happy. Many of our requested books came in at the library today so I took a quick ride to the library with the younger boys after dinner while Ian went to work with his dad mowing lawns. On the way to the library they played with their Tangoes; which are just tangrams in travel form. They were planning to play with them on the ride home too, but Evan convinced Alec to start reading his new book out loud to all of us. Alec had just picked up another Weird School Book-- Officer Spence Makes No Sense! and since we all love these books so much I was happy to listen too. We all laughed so much in just the few short chapters Alec read on the ride home. I just can't recommend these books enough; they are a great "fun" series of books to read.